Have you heard? 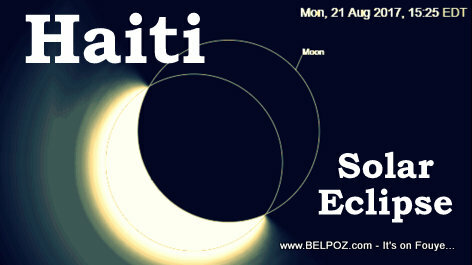 There's gonna be a partial solar eclipse in Haiti this Monday, 21 August 2017, starting around 1:59pm, The government is fully mobilized, this solar eclipse is the talk of the town. The National palace release a radio and television spot starring Tonton Bicha telling the public don't look at the sun on Monday. The Haitian National Police hit social media telling the population: "protect your eyes, don't stare at the sun on Monday 21 Aug 2017 to prevent eye problems in the future." « If a Haitian preacher ADMIT having killed people with voodoo in the past, shouldn't he be in prison?